Sodium bicarbonate against hair loss (1 hairprotection point)	Noch nicht bewertet. It has been proven that hair loss can be caused by an unbalanced acid-base balance of the body. Always make sure to take too many acidic foods to be. Is it still too acidic can proceed with various methods against it. Important is basically a diet that consists mainly of basic acting foods, ie fruits, vegetables, salad, whole grain cereals and potatoes. However, such is not always possible. You can balance Acidosis also with the highly effective acid buffer sodium bicarbonate. 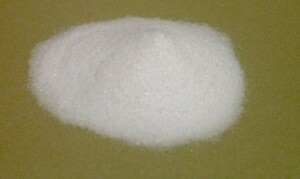 Sodium hydrogen carbonate has traditionally proven to be a mild medicine for heartburn and acid-related stomach problems. By taking 1-2 tablets (~ 2 g) before bedtime, the body is during the entire night in a balanced acid-base environment. The hair root has time to recover and regain strength.